COMMENTS: I started making MP pie slices and frosting them with Debbie May's best frosting recipe. I can't keep up with the demand! Sells like crazy! I make Margarita Lime Pie, Lemon, Raspberry and more! Turns out so cute. Looking forward to making pumpkin pie this fall. My finished product is about 6 ounces. "Life like pie slices! " COMMENTS: I have two of these molds now. It releases very easily. The slices look sooo real! I made two sets of pie soaps, one strawberry scented and one bakery scented. Everyone's first thought upon seeing the pie soaps is desert and upon smelling it, yum! COMMENTS: I love these molds. I use them to make cake candles with a huge scoop of ice cream. They work great for me. I purchased several for candles wax and will be purchasing again for new ones to make soap cakes. LOVVVVVE THEM!!! COMMENTS: Love this mold. Have tried making a cake before but found I couldn't cut it even. This made my life much easier. Now every cake slice comes out perfect. I have found that I need to let it sit an extra day before unmolding but other than that, very pleased with it. 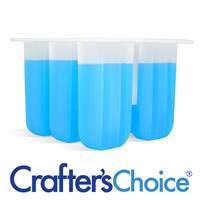 "Great mold very strong "
COMMENTS: Very easy to use, made perfect size pie/cake sliced M&P. COMMENTS: I did some pie scents and used this mold and it was very fun to do and see the results. COMMENTS: Great little pieces of cake ! Pretty sturdy but does warp slightly in hot process and bulge out on sides ! Still nice! COMMENTS: Awesome for making apple pie soaps that look like slices of PIE! "Love The Shape But Very Flimsy"
COMMENTS: I love the shape of the mold but found it to be very thin and flimsy, very unlike the other crafter's choice molds I have. I don't know if I would by this type again for the price. COMMENTS: Just made lemon meringue pie slices, cold process and they look just like the real pie. The mold releases easily and cleanly. I will find many uses for this mold. COMMENTS: I have been waiting to purchase this mold, and I finally did so as a present to myself for Mother's Day when I saw molds were on sale. It's very durable and has nice sized cavities. I can't wait to use it. COMMENTS: This mold is so easy to use and makes the cutest little soaps. "I love this mold "
COMMENTS: I love this mold it makes my soaps look like little slices of yummy pies that I can decorate different each time. "My Daughter thinks I am a Superhero "
COMMENTS: I just used this cake mold and my soap came out wonderfully. My daughter once thought that Bath and Body Works and those other big names companies was the best until I start using WSP products. WSP makes my products look so cute, fun, and professional and that is why I love this company. I love using this mold,I had trouble making and cutting my cake using traditional molds, by using this mold, my cake out prefect size and I am happy. My daughter came down stairs and saw my cake soap, and she smiled and said, mother I sure do love you. I was happy to hear that because we know when some of our children reach a certain age, we barely hear that from our children. I thank you, WSP, for doing another great job and helping me turn my products out the way that I want them to be. :) best wishes to you. COMMENTS: Cake, pies, you name it! I had to have this mold for the holidays. Pumpkin Pie, Cheesecake, Red Velvet Cake.. so much fun to be had! Just make sure you leave it in the mold longer then normal. Don't want to dent or smoosh your slices! COMMENTS: This is awesome and It opened my mind to an entire new product line, I also use CC bath whip to finish many pies with a dalop of bath whip to look like whip cream. COMMENTS: I used this to make a cheesecake slice soap. It came out perfect. The soap was easy to release from the mold however it did take a bit more time than usual to harden up.